You read it right guys! there's a new app for iPhone and iPod Touch that can manage the blood sugar levels of a person who have diabetes. 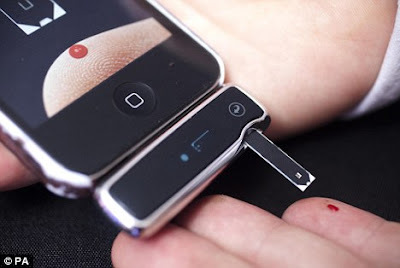 This is a device attaches to an Apple iPhone or iPod touch with a free Diabetes Manager App. 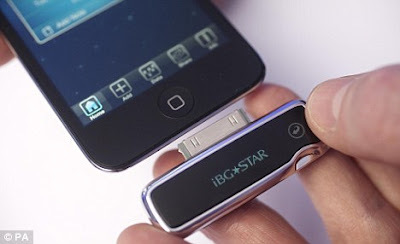 iBGStar device that store, track and analyze and monitor glucose through the free Diabetes Manager application. Its also give information about the carbohydrate intake, insulin injections and exercise. According to UK news, that this device has an accurate monitoring of blood glucose that is essential to the management of diabetes, and may help the 2.9 million people in the UK. However, high blood sugar can get serious complications and damage to the heart, kidneys, nerves and eyes. Medical Director for diabetes from pharmaceutical company Sanofi 'Dr Andrew Hockey said, "iBGstar is huge step forward." He added, "It harnesses the power of the latest technology to empower people with diabetes to manage their condition on a day-to-day basis. Comments or suggestions about "New iPhone and iPod Touch app for Diabetics" is important to us, you may share it by using the comment box below.